The Supply Insight rTooltrack has been discontinued. No direct replacement is available. 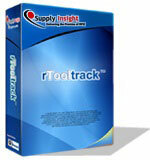 rTooltrack, by Supply Insight, is a simple turnkey solution for locating tools and other assets. rTooltrack uses passive radio frequency identification (RFID) technology minimizing the time spent completing inventory and locating missing items with a software interface that is easy to configure and use. Compared to barcodes, identifying items with RFID is exponentially faster and does not require line of sight.